You’d struggle to get people to agree that any game containing zombies isn’t already heading into the realms of a being a washed out and overused gimmick. 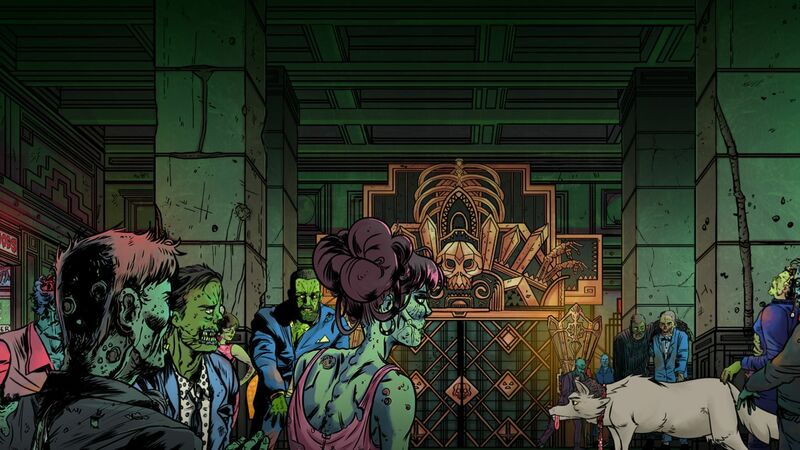 But for those of us out there still keen on getting in on an exciting new zombie adventure, and ready to believe there’s life in the old dog yet, there are many developers keen to throw us an original experience to enjoy. Outsider Games are looking to do just that and with a healthy dose of vampires and werewolves thrown in for good measure, they may have just succeeded in ensuring that Wailing Heights brings a totally unique experience for fans of all things supernatural to enjoy. Wailing Heights is essentially a point and click musical adventure game that takes us back to the swinging ‘60s, a time in which band manager Frances Finkelstein, the protagonist of our adventure, is doing everything possible to reunite the now deceased band known as The Deadbeats. The only issue however is that Finkelstein is still very much alive, and the dead, well… they don’t like the living so much, especially in the town of Wailing Heights in which only the dead are allowed to reside. For Finklestein, this is just a minor niggle in his grand plan to reunite the fearsome foursome of Shaggy, Fangs, Spectra and Z, and to ensure he doesn’t find himself on the wrong side of the supernatural, he’s willing to go to any lengths, even if that means possessing the bodies of others to win over the greatest rock and roll band Britain has ever seen. That’s not the only focus though and he’ll also need to find a way to utilise the powers of Wailing Height’s folk to exonerate his soul from permanent residence, after his invite to attend a gig in the town resulted in him being arrested for the crime of being alive! To help him attend to his pressing issues, players must make the most of the Possession mechanic, a key part in this musical adventure, and to progress through the game you’ll need to make the most of the Possession Wheel, the vital tool that allows players to take control over the various inhabitants of Wailing Heights. Before you can possess any of the town’s folk however, you’ll need to collect the right ingredients, write them into a song and sing your soul into the cold and lifeless body of the intended target. To do this you’ll need three things; a name – which will give the necessary lyrics of the song – then both a Love and a Hate for the intended character. These aren’t just given out willy-nilly however and to find these you’ll need to explore the town, talk to the locals and steal things from other songs to ensure you have the perfect spiritual tone that will grant you access to your chosen body. The first of these comes in the form of Soul Ghoulman, Public Defender for the deceased, former music industry lawyer and your initial target of possession as you look to free the soul of Frances Finkelstein from Wailing Heights. Whilst possessing characters is a rather unique mechanic to have in the game, it is also an important one, for the simple reason that each of the townsfolk allow access to unique areas from which you’ll find the items needed to progress. They also have their own unique abilities too, such as finding specific items and reading the thoughts of other characters; both of which are vital for story progression. The story itself is also a key focus and it plays out in a rather interesting way too. Each conversation and story snippet are shown in a clever comic book style fashion, with the various characters appearing in bubbled text with plenty of sarcasm, wit, humour and comedic narrative taking place throughout, allowing you to learn more about each of the town’s inhabitants. 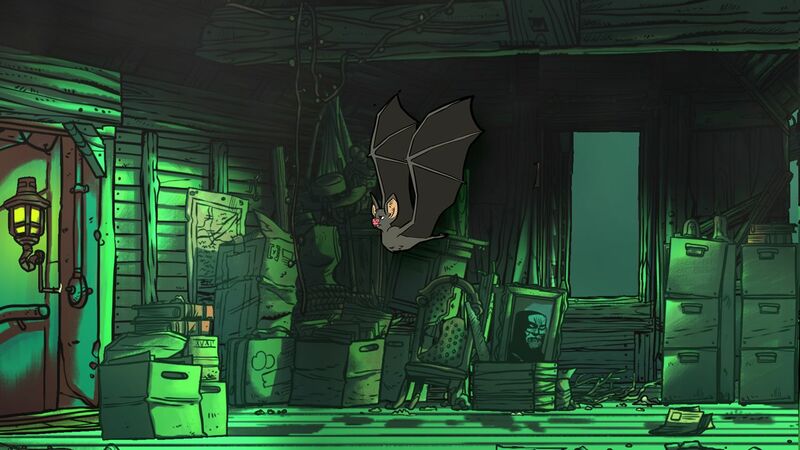 Being a point and click adventure ensures that there aren’t too many controls to worry about; the left stick controls player movement as well as scrolling the comical dialogue options during conversation, A is the typical option select, X allows access to your character’s unique ability, Y brings up the inventory and Possession Wheel and the right stick allows you to control your ‘bat’ flight abilities – for fear of totally spoiling the narrative this is something I don’t wish to divulge any further. One thing that can’t be ignored is that from the very first moments, Wailing Heights feels entirely original and unique in both its design and gameplay. The art style stands out incredibly well, mostly thanks to beautifully detailed cartoonish visuals, the story brings an engaging experience from the off and the comedy and countless one-liners that litter the many conversations make getting to know each of the characters an enjoyable and surprisingly memorable task. What’s more is the fact that Wailing Heights is accompanied by some fantastic audio, which on occasion can even hold the key to the puzzles you are trying to solve. 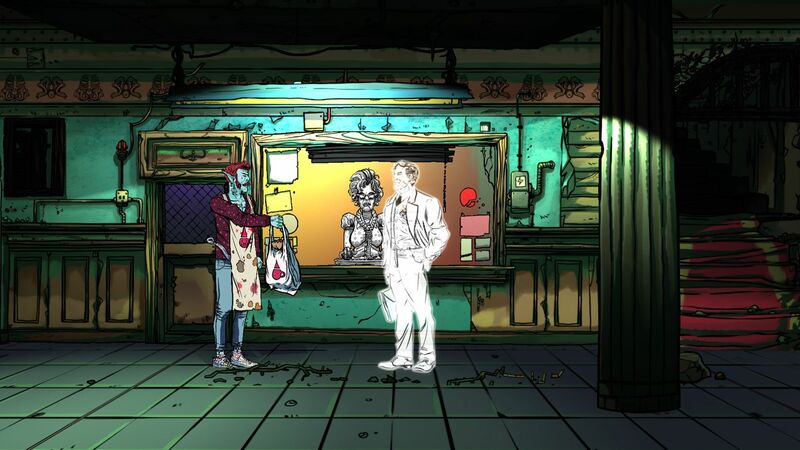 All in all, there is very little not to love about Wailing Heights; the story is easy to follow, the characters feel varied and interesting and the whole game feels unique when compared to any other point and click adventure. There are just a couple of things however that could probably do with being changed. The first niggle is the fact that when you possess a new character, the one you’re leaving remains behind meaning should you need to get back to that character you may well find yourself having to backtrack massively once you’ve completed your task. Of course, this isn’t a major grumble in itself but when you consider the fact that the character movement is quite slow and a little tedious at times, it can be a little irritating to not have a faster way of jumping to a new character quickly. This can be combated by utilising the character abilities, especially the zombies whose notable ability is increased speed, but it would be nice to at least spend a little more time enjoying the short and sweet adventure than actually having to travel between different characters. One other issue that comes into play is the lack of notable hints in Act 2. Once you’ve progressed beyond the rather linear puzzles found in Act 1, you will have access to multiple characters from The Deadbeats for Act 2, seeing multiple puzzles come into play. This itself wouldn’t be an issue but with story items often relative for more than puzzle, it can become a little confusing, especially when it’s not made obvious what you’ll need to do and are instead left with a very vague objective. These are only minute niggles in the overall experience though and whilst I don’t want to give away more than is necessary, Wailing Heights is without a doubt one of the better point and click adventures you’ll find on Xbox One. It’s good for a laugh whilst bringing about a serious story that players can get lost in, delivers stunning art that makes it like watching a live comic in action, and with a scene-setting soundtrack playing throughout, there is very little else to wish for when you get deep into the experience. 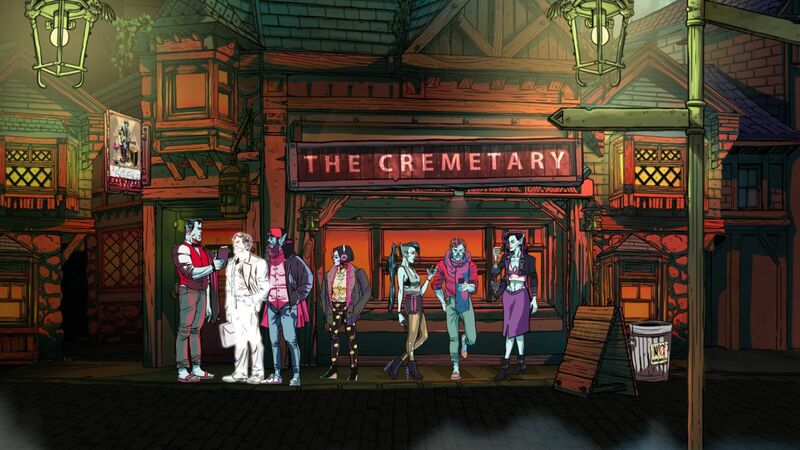 Sadly, the game isn’t the longest adventure out there and it’ll only take you a few hours to reach the conclusion, but if you have an afternoon free and fancy playing through one of gaming’s most unique adventures, ensure you choose Wailing Heights as your title of choice.